Topographic and mineralogical composition studies of the lunar far side within the rover's patrol area. The radio-astronomical study is particularly intriguing. The lunar far side always faces away from Earth, so it's is free from interference from our planet's ionosphere, human-made radio frequencies and auroral radiation noise. Solar radio emission is also blocked during the lunar night. "Hence, the lunar far side has been believed as the best place for the low-frequency radio astronomical observation," the researchers wrote in the recent paper. The paper also detailed the eight scientific payloads toted by the mission. An artist's illustration of China's Queqiao relay satellite, which will relay data between controllers on Earth and China's Chang'e 4 lander-rover pair on the moon's far side. Queqiao launched in May of 2018; the Chang'e 4 duo will lift off on Dec. 7. The Chang'e 4 lander carries the Landing Camera (LCAM), the Terrain Camera (TCAM), the Low Frequency Spectrometer (LFS), and the Lunar Lander Neutrons and Dosimetry (LND), which was provided by Germany. The rover has four instruments as well: the Panoramic Camera (PCAM), the Lunar Penetrating Radar (LPR), the Visible and Near-Infrared Imaging Spectrometer (VNIS), and the Advanced Small Analyzer for Neutrals (ASAN), which was provided by Sweden. The LFS was newly developed for Chang'e 4 lander; the other native Chinese payloads are inherited instruments from Chang'e 3, the researchers wrote. The LPR instrument will likely be able to detect subsurface structure on the robot's patrol route, and to detect the thickness and structure of the lunar regolith. The device is a nanosecond impulse radar with bistatic antennas. It works like this: An ultra-wideband nanosecond impulse is produced by a transmitter, and then sent through the transmitting antenna down to lunar surface. The echo signal from the underground target is received by the receiving antenna, amplified in the receiver and then restored as a data record. According to a story earlier this year by China's state-run Xinhua news agency, Chang'e 4 will also carry a tin containing seeds of potato and arabidopsis, a small flowering plant related to cabbage and mustard. It may also tote silkworm eggs. This "lunar mini biosphere" experiment was designed by 28 Chinese universities, led by southwest China's Chongqing University. The cylindrical tin, made from special aluminum alloy materials, weighs roughly 6.6 lbs. (3 kilograms). A view of the moon's South Pole‐Aitken basin. The SPA basin is the largest and oldest impact basin of the moon. Although the terrain is low, this region is not filled with mare basalts as other moon basins are, Jia and colleagues noted, suggesting that it may have a special thermal history and unique evolution features. Studying the materials in the region could therefore help reveal the composition of the crust and even the mantle of the moon, the researchers wrote. China's next lunar probe, Chang'e 5, is designed to bring select samples from the moon back to Earth. 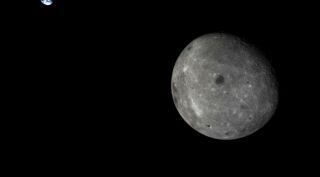 It builds upon a progression of Chinese moon explorers: the Chang'e 1 and Chang'e 2 orbiters in 2007 and 2010, respectively, Chang'e 3 in December 2013, and Chang'e 5 T1, which launched a test capsule on an around-the-moon journey in October 2014. The capsule parachuted safely back to Earth eight days after liftoff.